The definition of necessary evil is an unfavorable thing (This Fight) that someone (The WBC) believes must be done or accepted because it is necessary to achieve a better outcome — especially because possible alternative courses of action or inaction would be worse. Yep that pretty much defines this unnecessary bout that even Showtime didn’t want to broadcast originally. Forced because of a failed drug test by Luis Ortiz, now Bermane Stiverne steps in as the replacement/mandatory. Looking at this predicament from a glass half-full standpoint there’s definitely worse replacements then Stiverne. After all he did take step aside money to allow Luis Ortiz to fight Wilder, agreeing on paper only if he got the winner between Wilder and Ortiz. That was assuming he would’ve beaten Dominic Breazeale, whom he was originally scheduled to face on the undercard at Barclays Center in the borough of Brooklyn. In their first meeting back in January 2015 the shoe was on the other foot. Stiverne was the WBC champion and Deontay Wilder was the unproven, much-questioned challenger. On that night in Las Vegas from the MGM Grand Garden Arena, Wilder made America proud with a resounding victory. Wilder used his long active jab and lateral movement to fluster Stiverne all night long. Bermane did manage to connect with a few hard shots but nothing big enough to really affect Wilder. Post fight Stiverne was sent to the hospital suffering from dehydration. So here we are again almost three years later. Wilder was very active in 2015 and for most of 2016. The last year and a half, injuries and positive PED’s tests from his opponents have put a sudden halt to ‘The Bronze Bombers’ career trajectory. Stiverne has done nothing to prove worthy of being mandatory status which is the reason no one cared about the rematch in the first place. The WBC, short for We Be Crooks, definitely had their eyes on securing a percentage on the purse rather than a legit fighter for the mando. This rematch is placed in the bell-ringer category meaning I will stay tuned as soon as they ring the first bell. There’s a decent chance this fight plays out somewhat differently in the rematch. 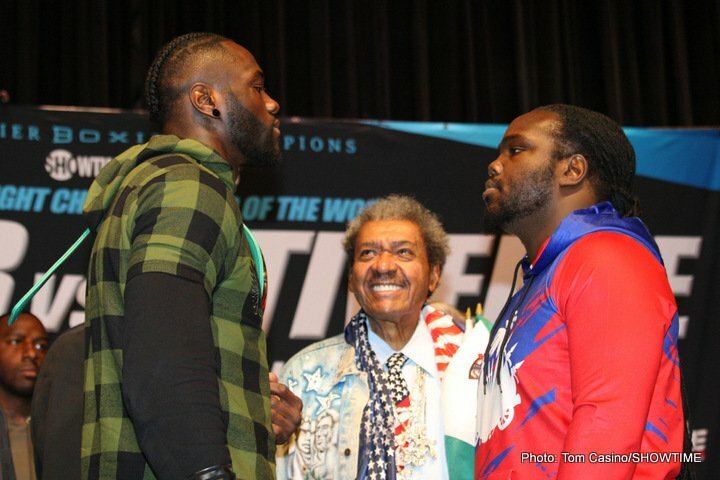 If in fact Stiverne was very sick in their first meeting it will be clear as day and hopefully lead to a two-way fight. Another angle is the deep-rooted emotions that are festering inside of Deontay. Wilder even stated he shouldn’t fight Stiverne because he may cause him serious bodily harm beyond the normal bumps, bruises, and blood. I could actually see Wilder stepping on the gas pedal much early abandoning the prior game plan for the sake of blood splatter and a KO statement. And if that gets Wilder into some trouble it’s not like he can’t go back to the stick and move play as long he doesn’t get stopped in the process. The one thing to keep in mind Stiverne is not a come forward, hunt a man down type of fighter. So if Wilder does decide to take the fight inward Bermane is a capable counterpuncher with plenty of power. I will call for a more entertaining and competitive fight this time around. My Official Prediction is Deontay Wilder via 11th round technical stoppage. Side Note: Make sure to check out the undercard of this Showtime Tripleheader on Saturday night. Sergey Lipinets makes his first attempt at a junior welterweight belt against veteran Akihiro Kondo. Plus, all-action fighter Shawn Porter meets the hard-nosed Adrian Granados in what should steal the night.